Adrianna Sanchez, Ezequiel Jaime, Justin Griffin, Hector Pedromo, Litzy Besabe and Manny Ramos from Vaughn Occupational High School won this month’s Cooking up Change® competition with their menu of Cajun Fish Po’ Boy, Elotes Salad and Apples Dippers. 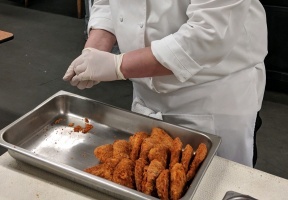 Their winning meal will be served at Chicago Public Schools next semester and the winning students also garnered scholarships to Washburne Culinary Institute. 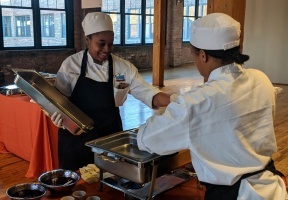 Vaughn Occupational High School was one of seven high schools across Chicago that competed in the Cooking up Change® culinary competition Wednesday at the Bridgeport Art Center. 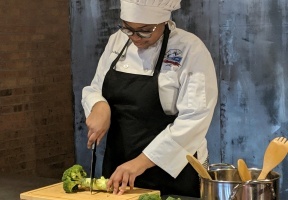 Healthy Schools Campaign’s Cooking up Change® is an annual cooking competition that challenges Chicago high school culinary students to create healthy, great-tasting meals that meet the real-life requirements of the school meal program and the budget of about $1.40 per meal. Cooking up Change® serves up life-changing opportunities, helps students realize their own potential and puts student voices front and center in the national dialogue about school food.